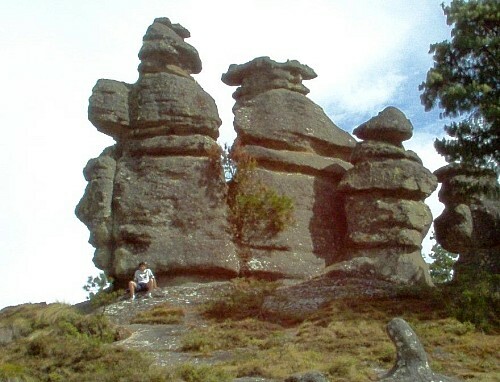 The Valle de las Piedras Encimadas (Valley of the Stacked Rocks) is 150 km from the city of Puebla in the northern part of the eponymous state. The Piedras Encimadas are rock outcrops occupying an area of about 4 square km (990 acres) centered on a small valley at an altitude of 2400 meters above sea level. The dominant natural vegetation is pine-oak forest. The main natural attraction of the area are the numerous, fascinating and photogenic”stacked rock” formations. The stacked rocks of the Piedras Encimadas can easily be likened to people (soldiers, sentries) and animals (dinosaurs, elephants, turtles), depending on the sensibilities of the observer. The shapes appear even more “fantastic” on the frequent occasions when clouds roll into the valley, enveloping the rocks in a thin mist. According to geography researchers from the National University (UNAM), the volcanic rocks (rhyolites and andesites) forming the Piedras Encimadas date from the Tertiary period (60 million years BP). The Piedras Encimadas look very similar to the much-studied granite “tors” found in the UK and elsewhere. Indeed, they may even have been formed in a similar way. However, geologists still debate precisely how tors were formed, and their uncertainties almost certainly apply equally to the Piedras Encimadas. Most theories of tor formation (see link) involve the concept of “differential weathering”. This occurs when some parts of an area weather (disintegrate) more rapidly than others. Differences in weathering rates result from a variety of reasons, including differences in rock types and resistance within the same rock type, as well as localized changes in the climate, vegetation cover, aspect (direction the slope faces), altitude or exposure to air or water. 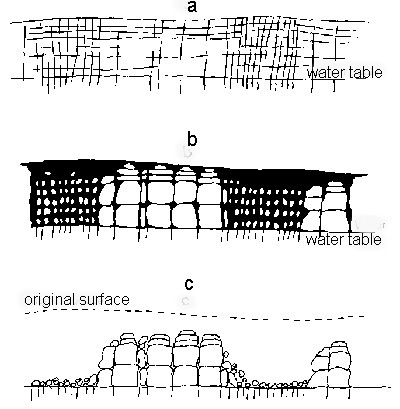 The shape of many of the blocks of rock forming the Piedras Encimadas does suggest that they were originally weathered deep underground from chemical reactions they underwent as water percolated slowly down towards the water table. Such a process would have acted more on the upper faces of each block, rather than the lower faces, producing a block that was rounded above, and almost flat below. If the blocks had been modified by erosion (the other major possible interpretation), then it is more likely that both the upper and lower faces of each block would be equally rounded or that the lower face would be more eroded than the upper face. Regardless of the details, it is almost certain that the curiously-shaped Piedras Encimadas were formed by a combination of volcanic action, differential weathering and erosion. The Piedras Encimadas offer lots of interesting possibilities for geography fieldwork.